In San Francisco, violent earthquakes are a fact of life. From the big one' of 1906 to the World Series stopper of 1989. Can we solve the mystery of earthquakes before the next big one strikes? The Aztecs believed the world would end by earthquake and fire. For a moment in 1985, it seemed they were right. Mexico City was struck by an earthquake both deadly and mystifying. How did people survive for nine days in the rubble? It was Japan's worst disaster since World War II. 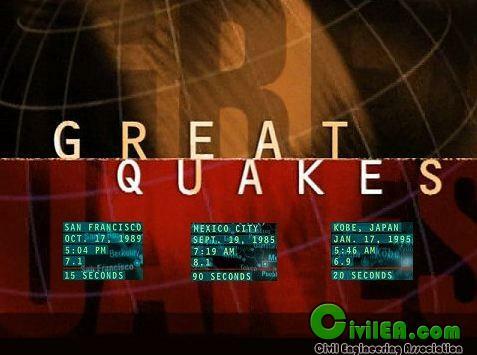 The most deadly earthquake since a 1923 Tokyo quake that killed 140,000 people. The Kobe earthquake was not just a physical earthquake. It was also a cultural earthquake, because it called into question so many bedrock beliefs of the Japanese. Yet more than a Japanese tragedy, this was perhaps a preview of an even greater disaster.